I love a good casserole, I find they are good hearty meals and there are endless possibilities as to what ingredients you can use to make one. 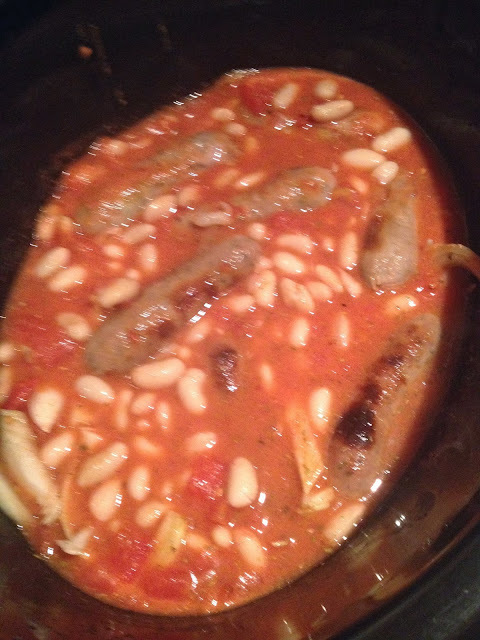 This week I opted for a sausage and bean casserole which I made in my trusty slow cooker. * Brown the sausages under the grill. * Whilst waiting for the sausages to colour, prepare the beef stock and slice the onion. * Mixed together the beef stock, tomato puree and chopped tomatoes. * Place all ingredients into the slow cooker for either 4 hours on high or 8 hours on low. We opted to eat this with some crusty bread rolls this time but normally we would serve with new potatoes, you could always cook the potatoes in with the casserole to save time. I love a sausage casserole too - great way to use up any leftovers!